It has been said that the best part of being a parent is becoming a grandparent. For the most part, grandparents don’t have to worry about homework problems, bad attitudes, and everyday life with kids. 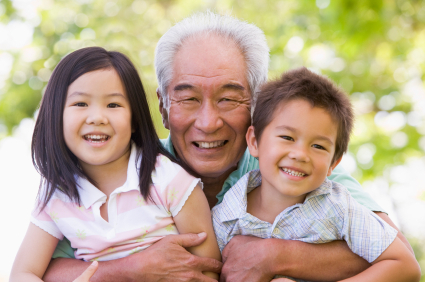 As a grandparent, you can dote on your grandchildren (a.k.a. spoil them rotten) and send them back to their parents at the end of the day. But when you do get the grandkids for a day or more, how will you spend the time together? Kaye Swain, a baby boomer and grandmother of more than a dozen grandchildren, offers eight time-tested, super-fun activities for a variety of ages, abilities, and numbers of grandkids. “Board games are a big favorite with my grandkids,” says Swain. Their top picks include chess, checkers, Trouble, and Sequence games. She highlights Sequence for Kids as a board game that’s great for all ages – even a group as disparate as a 4-year-old, a 6-year-old, a 10-year-old, and Grandma. This game, where you get people out by throwing a ball to tag them, has been a hit with Swain’s grandchildren for years. “I love it for the exercise and because I can actually catch them,” she explains. “Traditional tag is more challenging as it’s hard for many grandparents to run as fast or get around corners as easily to get our grandkids out. We stand a much better chance with ball tag.” Of course, it’s best to use cheap, lightweight balls so no one gets hurt. “Crafts are a great way to keep grandkids busy and happy using their hands and brains,” says Swain. Plus, the finished products can be given as gifts. “Since I usually work with several grandkids at a time, I pick crafts that don’t require a lot of one-on-one help,” she adds. Her personal favorites are wooden ornaments to color with washable markers or paint, and foam gingerbread houses. If she’s only working with one or two grandchildren, she chooses simple crochet and cross-stitch projects. “Singing songs and reading books together was something we all enjoyed for many years and that I highly recommend,” says Swain. “I still occasionally do it over the phone when talking with one grandkid.” Their favorite songs include faith-based anthems like “Jesus Loves Me” and “The B-I-B-L-E,” and their best-loved books include Sandra Boynton stories like Pajama Time! and the If You Give a Mouse a Cookie series. If you don’t live near your grandchildren or you just want to connect with them between visits, Swain recommends using game apps like Words with Friends and Carcassonne. “They are handy for long-distance grandparenting, but it can sometimes be challenging if they don’t have someone at their end who can help them get started,” she points out. If the kids are old enough to manage the app on their own, or a parent is available for assistance, gaming with Grandma and Grandpa can be tons of fun. The best part is all of these activities can still be done right here at Lighthouse Senior Living, you don’t even have to leave the comfort of our care!